Post idea credit to the lovely Beth @ The Quiet People. 1. DAMN THIS BOOK IS GORGEOUS. 2. I feel that I shouldn't be bored. 3. Can we just have the entire book from Kaz's point of view please and thank you. 4. Inej is too badass for all of us. 5. Shut up Nina literally n o o n e c a r e s.
6. There's a bi one, right? Is Kaz the bi one? Because if Kaz is the bi one this book will go from two stars to five in one second flat. 7. I'm not saying Wylan and Jesper should get together but Wylan and Jesper should totally get together. 8. THIS ISN'T EVEN A LOVE TRIANGLE ANYMORE. IT'S LIKE. A FREAKING HEXAGON. 9. O H M Y G O D J E S P E R J U S T K I S S W Y L A N A L R E A D Y. Trust me. It's what you want to do. 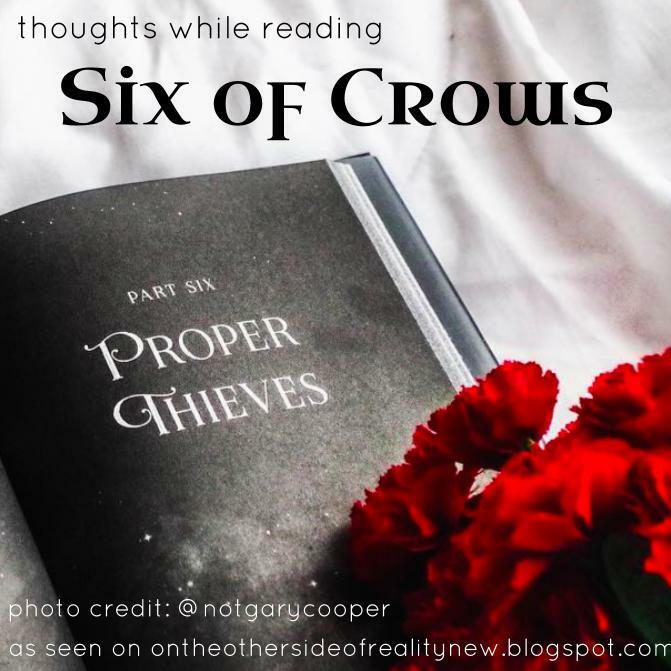 Have you read Six of Crows? What did you think of it? If you haven't read it - do you want to? Comment below, and have an amazing day. I agree about Nina - she was the only character I never really felt a connection to. Crooked Kingdom has some - but I agree. To be honest, I really only found Jesper, Kaz, and Wylan's POVs to be interesting.